Fluorescence penetrant inspection is to apply a permeate containing a fluorescent substance to the surface of the object to be inspected,penetrate into the surface defect by capillary action,and then clean the permeate from the surface to retain the permeate in the defect for development.A typical development method is a method of judging a defect by sprinkling a uniform white powder on the surface of the object to be inspected,sucking out the permeate from the defect,and expanding it to the surface. The coloring method is a penetrating flaw in which a penetrating agent in which a color dye(such as a red dye) is dissolved is infiltrated into a micro crack of a surface of a workpiece by capillary action,and after being washed, an adsorbent is applied to infiltrate the colored oil in the defect to the surface,according to the color spot and Stripe method for finding and judging defects. Fluorescence penetrant inspection is to soak the workpiece in the fluorescent permeate (prepare a sink,which is most convenient to use! ),wash the workpiece with tap water,and wash away the excess permeate.Note that the water flow and water pressure should not be too large to wash.When the surface of the workpiece to be inspected is cleaned to remove excess penetrant,it can be removed while being observed under ultraviolet light. 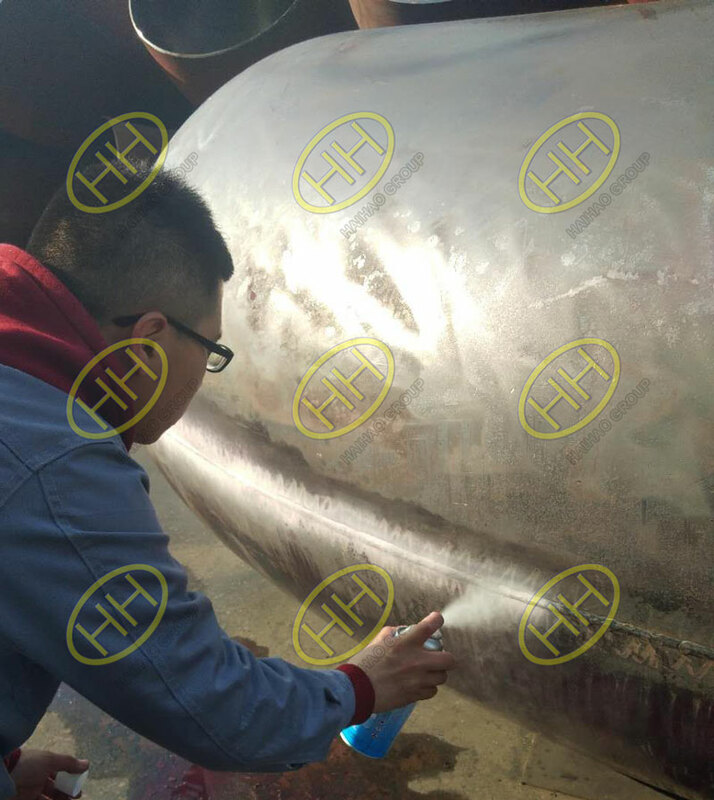 When the penetrating flaw detection method is used for local flaw detection of welds and large parts, brushing or spraying should be used.When testing a large number of small and small parts,it is advisable to use the dipping method.It should be noted that the surface to be inspected remains in the infiltration time.Wetting state.The method of removing excess penetrant removal depends on the type of penetrant employed,the method of applying the penetrant, the surface condition,and the shape of the workpiece being inspected.When the impregnation method is used, after the penetrant of the surface to be inspected is dripped,the cleaning agent is applied to the surface covered with the penetrant,and then the penetrant and the cleaning agent mixture of the surface to be inspected are washed away with the buffer water,and the water flow is not washed vertically.Check the surface.When using brush or spray method,first wipe the excess penetrant on the surface to be inspected with a clean gauze, then wipe it with a gauze moistened with or with a cleaning agent, and then wipe it with a clean gauze. In the case of fluorescence penetrant inspection,a power source is required,which is used together with an ultraviolet lamp,and is irradiated with an ultraviolet light source to cause the fluorescent substance to generate visible light having a long wavelength, and the surface of the irradiated workpiece is observed in a dark room,and is judged by the visible fluorescent image.The size,location and shape of the defect.In addition,the tester enters the dark zone and can perform fluorescence penetration detection after at least 3 minutes of dark adaptation.The inspector cannot wear glasses that have an effect on the test. In the case of pigmentation penetrant inspection,the defect display shall be evaluated under white light.Usually,the white illumination of the surface of the workpiece shall be greater than or equal to 1000 lx.When the portable equipment is used for inspection,the visible illumination may be appropriately reduced due to the conditional limitation.Not less than 500lx. 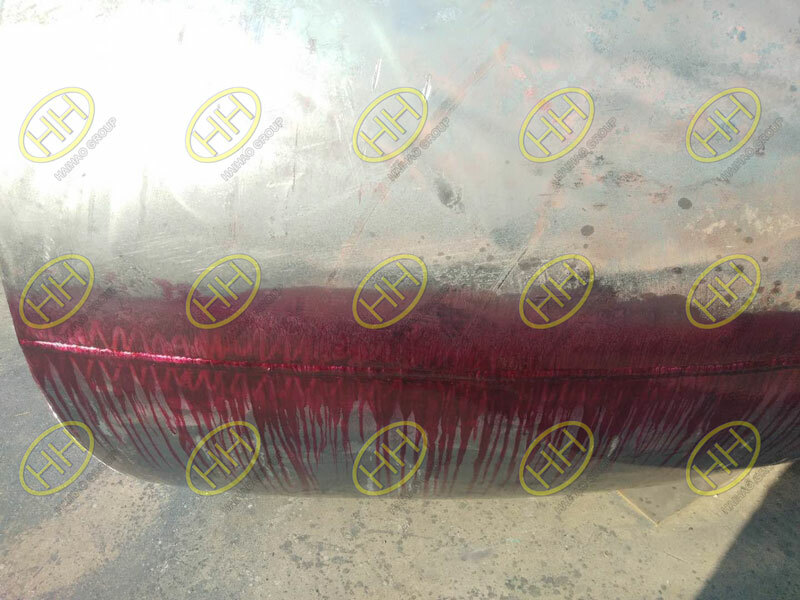 The sensitivity of fluoroscopy penetrant inspection is higher than that of pigmentation penetrant inspection,but the penetration cost of staining method is lower than that of fluorescence method. When we choose the penetration detection method,we should first meet the requirements for detecting the type and sensitivity of defects.On this basis,it can be determined according to the surface roughness of the workpiece to be inspected, the size of the inspection batch,and the water source,power source,and cost of the inspection site. For workpieces with smooth surface and high detection sensitivity,post-emulsion coloring method or post-emulsification type fluorescence method may be used,and solvent removal type fluorescence method may also be used. The workpiece with rough surface and low detection sensitivity should be washed with water or water. The solvent removal type coloring method should be adopted for the detection of the water source and power source on site. For batch inspection of large workpieces,water-washing or water-washing fluorimetry should be used. For local inspection of large workpieces,solvent removal type or solvent removal type fluorescence method is preferred. Next： What is hydrostatic test?